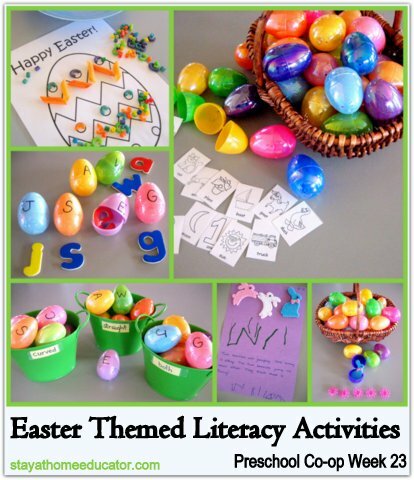 Last week I posted seven Easter themed math activities…today’s post is all about Easter themed literacy! I’m sharing six fun reading and writing activities for preschoolers. 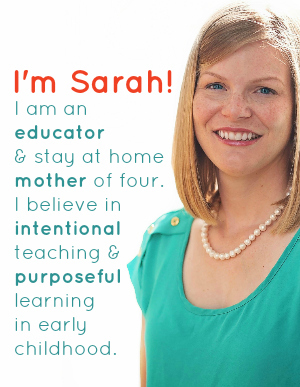 And as usual, at the bottom of the post you will find my phonemic and phonics lesson plans for Preschool Co-op week 23. 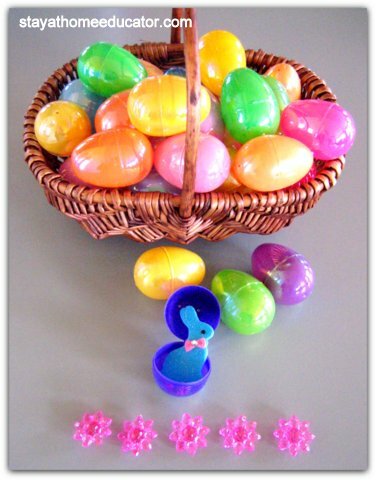 Easter Themed Counting Phonemes – Using some colorful Easter eggs, fill each egg with a small Easter or spring themed trinket (I used the felt stickers from last week’s math post). Have on hand a counting manipulative. Invite your child to open the Easter eggs you have prepared. As each one is opened, ask your child to use the counting manipulative to show the sounds he hears in each word. For example, William opened an egg with a felt rabbit in it. So, he separated five manipulatives, one for each sound in /r/ /a/ /b/ /i/ /t/. 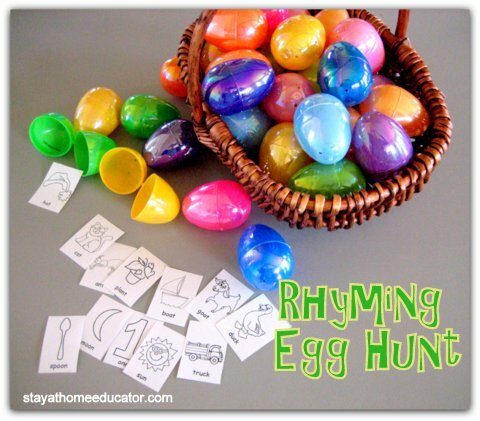 Rhyming Easter Egg Hunt – For this activity I cut out the images from rhyming worksheets I’d found online. (Click here for the link). I placed one image inside each egg, making sure each egg/rhyme had a match. Then I hid them around the house. I invited William to first search for all the eggs. Once he found them all I invited him to open them. Then we worked together to make the rhyming matches. 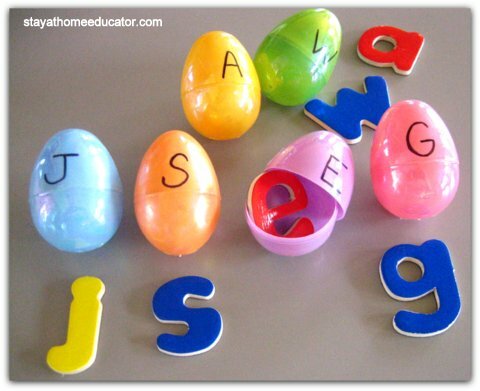 Easter Themed Upper and Lower Case Matching – Have available an Easter egg for each letter you’d like to include in this activity and also some letter manipulatives that will fit inside an egg. (I used some lower case wooden letters). Write an upper case letter on the outside of each egg. Leave the lower case letters in a basket of bowl. Set the eggs out for your child to see. Invite your child to find the egg and letter matches. Note: Because William knows all his letters, I included all 26, however you can choose to only focus on a handful of letters. 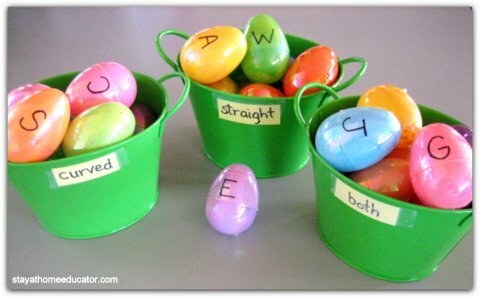 Easter Themed Letter Sort – For this activity you will need three bins and a set of Easter eggs, each one labeled with an upper case letter of the alphabet. Label the bins according to how they will be sorted: letters with curved edges, letters with straight edges, and letters with both curved and straight edges. 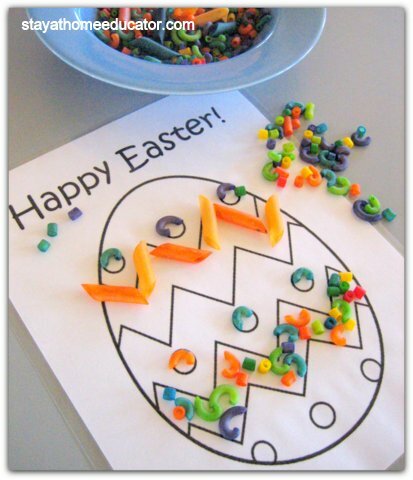 Invite your child to sort the letter eggs according to their shape. 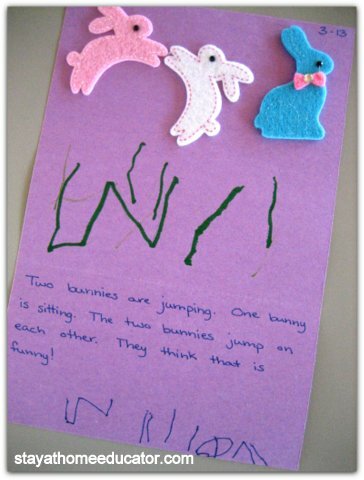 Easter Themed Sticker Stories – This is always one of my favorite writing activities to do with William. I invited William to choose three stickers from a stash and place them on a half sheet on construction paper, explaining that we would write a story about his stickers. Once he had finished writing his story himself (which looks a lot like the letters of his name), and asked William to read his story to me. While he read, I recorded his story as he told it. 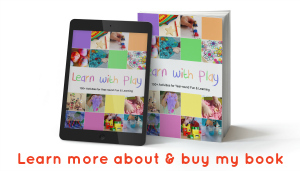 Easter Egg Fine Motor Mat – I call this mat a fine motor mat instead of a play dough mat because I wanted to show that play dough mats can be used in various ways. In this case, I brought out our dyed pasta and invited William to decorate the egg using the pasta, and since the paper was laminated the pastas were difficult to keep in place, so this activity required a lot of patience and was amazing fine motor practice, even for me! Click Happy Easter! Play-doh Template. Phonics: Letter Ww – Students learned to identify the letter Ww and it’s sound. The teaching mom used several color photos beginning with the /w/ sound. Examples: watermelon, wagon, wheel, whistle, etc. Students practiced saying each picture name, emphasizing the /w/ sound at the beginning. These are such creative ideas. I can’t wait to put them to good use! I love that letter sort game and the pasta Easter egg game. I am never disappointed by your ideas. I’m definitely going to print off some of those rhyming sheets to play a game with my preschooler. The Easter eggs will make it extra fun. Thanks for your amazing ideas! I like the Easter letter sort activity. It will help my son focus on the different aspects of each letter (curve, straight line, etc.) Thanks for the great idea!